Hi, Y’all! 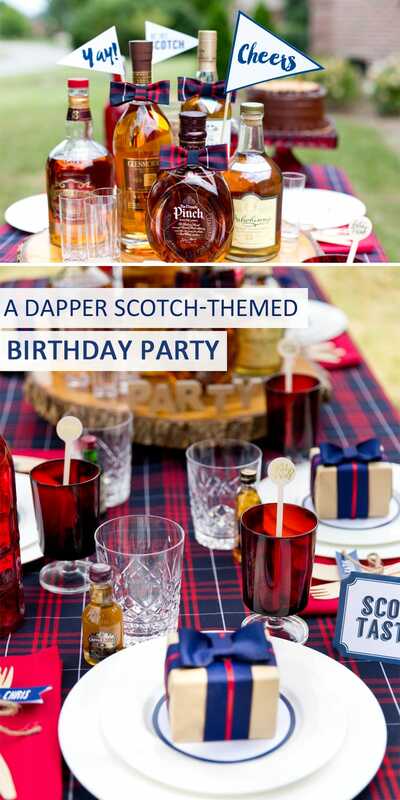 I’ve been looking forward to throwing my husband this dapper scotch themed birthday party for months! 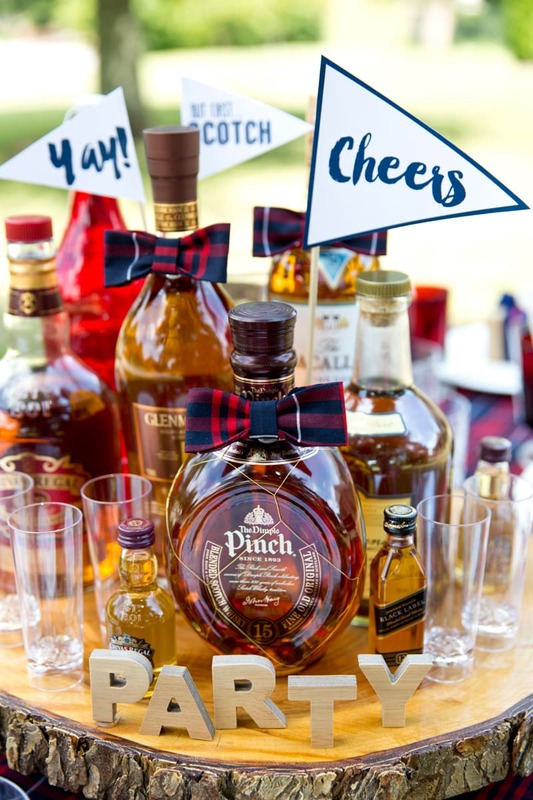 My husband loves scotch (I surprised him at our wedding with a scotch bar), and I haven’t styled too many adult guy themed birthdays so I was thrilled to host a dinner party for his birthday! I know it can be hard to find inspiration for guys’ birthdays (here are some other fun ideas too). I’ve included my tips, ideas, and resources below the photos! Plaid was a no-brainer for my table covering! I couldn’t find the perfect plaid fabric in stores so I hopped online and bought some online (very reasonable and fast shipping). 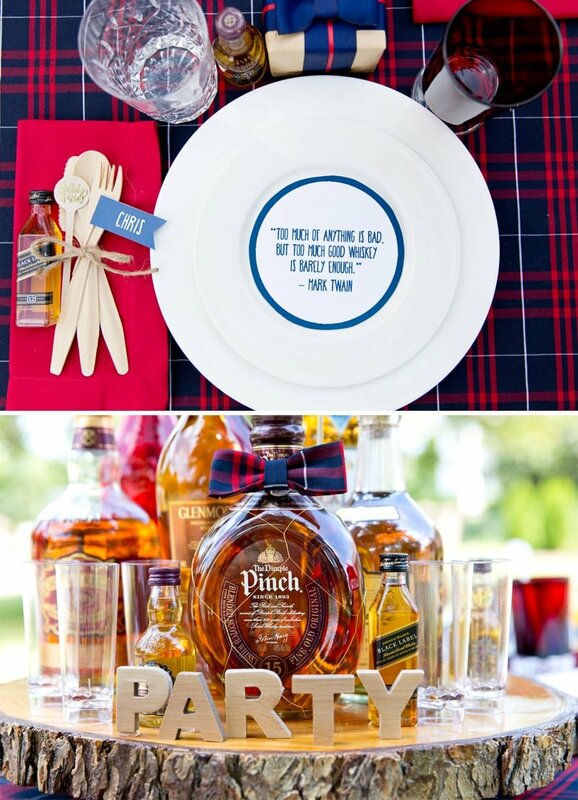 There are dozens of fun plaid prints that are masculine and perfect for a table covering. You could also look for a wide rugby stripe in navy,burgundy, or hunter green. Or just go with your bare tabletop, that would work too! 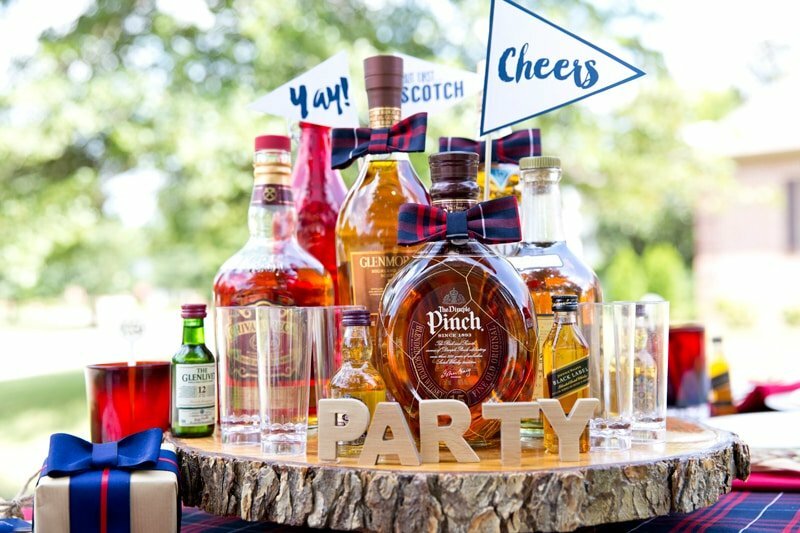 I also created a few fun pennant flags with sayings like “But First, Scotch” and “Cheers” to set down inside scotch bottles on my centerpiece! Speaking of the centerpiece, my brother created this amazing wooden serving tray from a slice of wood in his yard. How cool?! 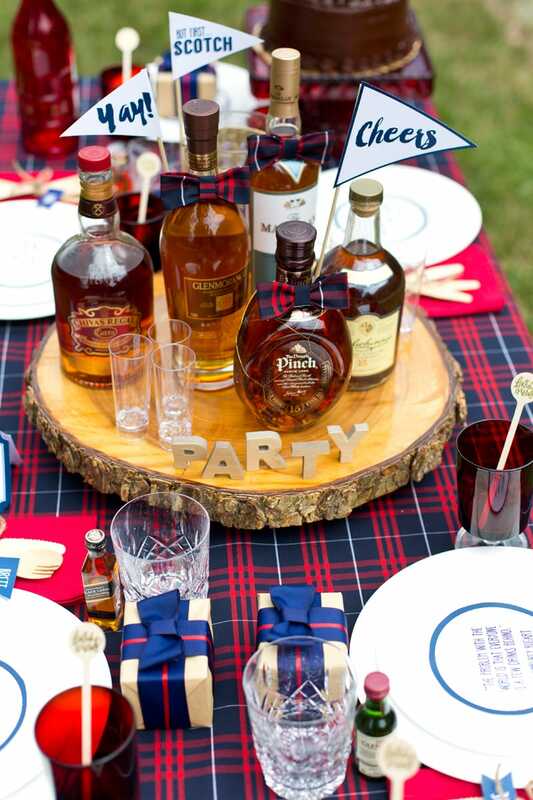 It was the perfect serving tray for a variety of scotches. I included little tasting shot glasses for guests. Mini wooden letters from the craft store spelled out “PARTY” (another fave detail)! To keep with the “dapper” theme, my Mom helped to create bow ties out of extra strips of the fabric. We glued these on to the scotch bottle tops. This is my favorite detail! We carried out with navy bow ties on top of little favor boxes for each guest. 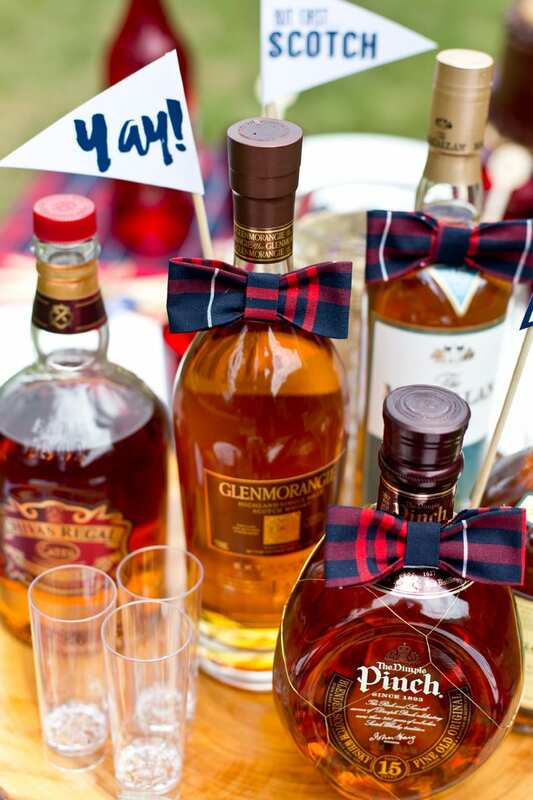 The kraft paper with red and navy ribbon tied in beautifully with the plaid design on the table! 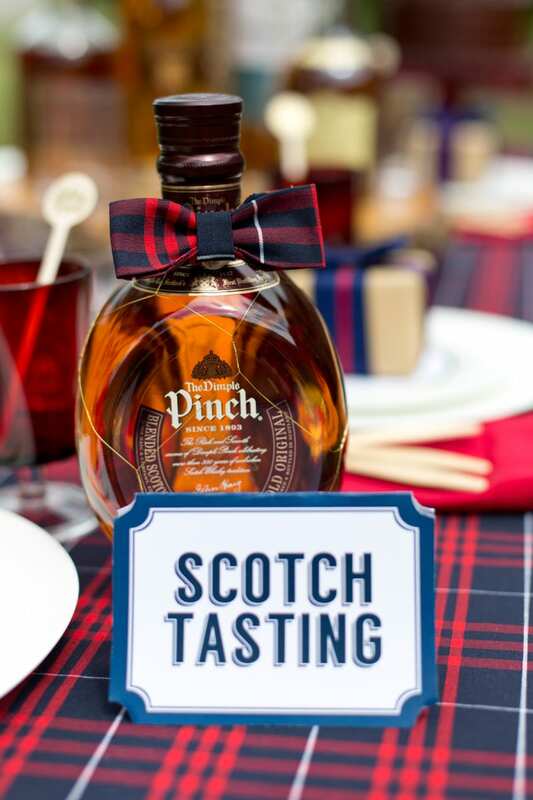 Each guest also had a mini scotch bottle at their place setting. As for dessert, my husband is a cookie cake kind of guy. He also loves yellow cake with chocolate frosting so I did a little DIY combo this year. I kept things easy for myself (wrangling Blakely, George, and getting the party ready can make things wild) and ordered a cake from my bakery. I asked for nothing on top and extra chocolate buttercream on the side. Then I baked a large chocolate chip cookie, set it on top, and finished the edges with piped chocolate frosting. Added in gold candles and TA-DA! If you’d like me to do a full post with step-by-step pictures, leave me a comment below! The cake was DELISH! You can shop similar items I pulled below. 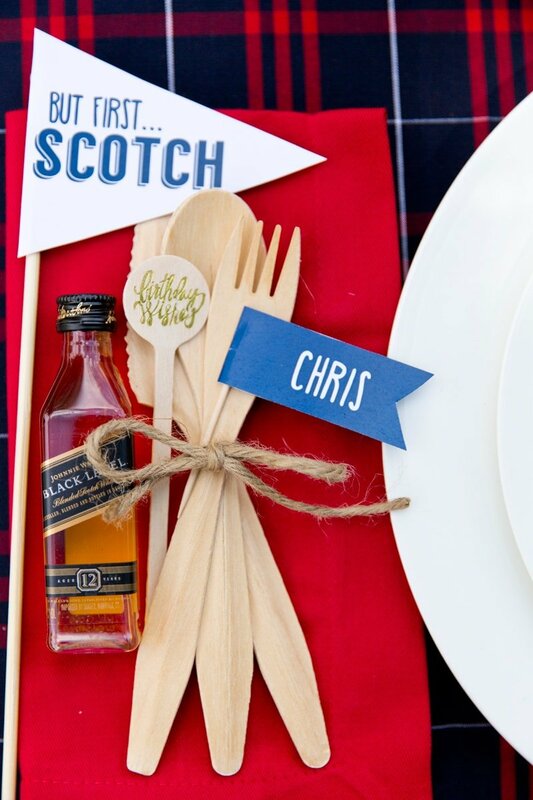 I hope you’re inspired to throw your guy the ultimate birthday dinner party this year! Cheers! Thank you soo much, Amanda!! This is so fun, and I don’t even like scotch! But I love how you pulled it off, a great party for a guy for sure. 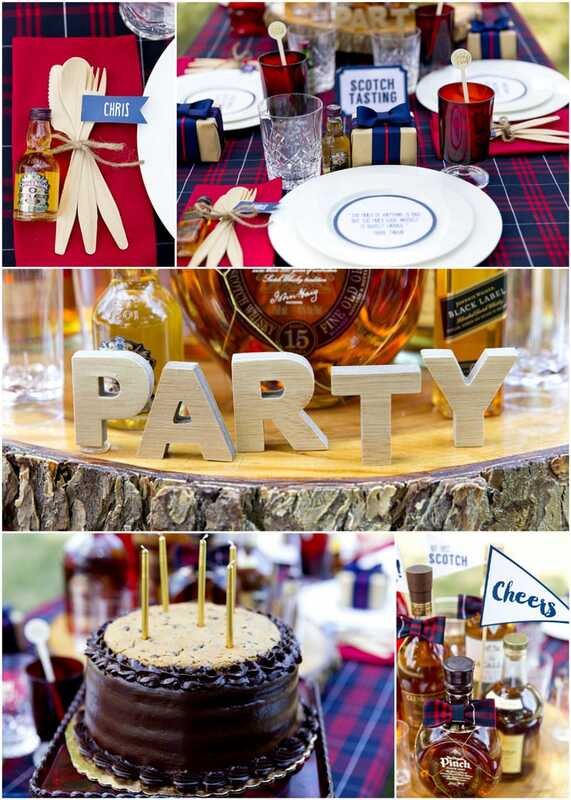 I love the plaid and all the rustic type elements as well. Great job! This is awesome! I love every detail! Awesome post! Please share in a post with step by step pics!! Love this idea!! Thank you Marty! Will work on this! Love this! What did you serve for food? I would love a step by step for the cake please!! My hubby would love a cake like that as well, great idea! HAHA. Yes, I’ll get right on that! This party is so fun! I LOVE the plaid! I would love to read a full post on the cake – it sounds absolutely delicious! What a great idea! My husband has a birthday coming up in October. He’d love something like this. 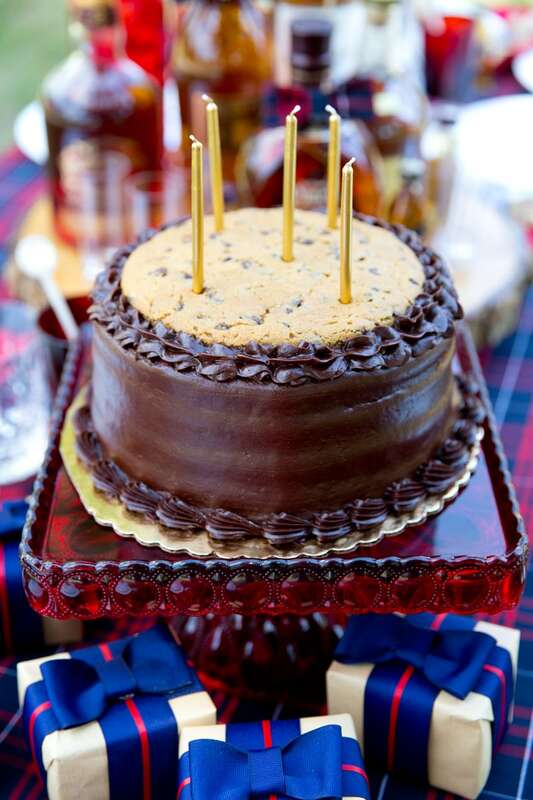 That chocolate cake with the cookie on top is so fabulous and I love those plaid bow ties. This was a great idea and I’m sure your husband was very appreciative. I love this idea!! thank you for sharing, planning for hubbys 30th in February. How did you do you invites? Using this theme for my husbands 40th. Do you have a tutorial for the flags??? I just made them but email me if you want more tips, etc!